My husband works outside of the home and we try to be as budget conscious as we can about his lunches. 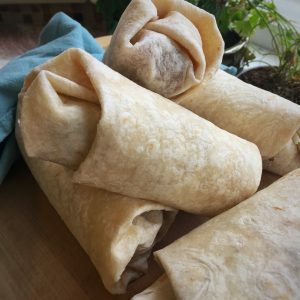 Eating out every day can get expensive but we don’t always remember to pack a lunch the night before… which is why we always try to have a stash of these burritos in the freezer. They are packed with protein from the beans and brown rice and quick to heat up! There is nothing fancy about this recipe but the vegetarian refried beans serve as a binder, the way a cheese would. Making this burrito the perfect vegan lunch for someone on the go! In a large skillet heat the olive oil over medium high heat. Once warm add the peppers and onions. Sauté for 3 minutes. Add butter beans, rice, salsa, paprika, salt, garlic powder, and cayenne pepper. Stir to combine and cook for another 2 minutes. Using a spoon begin to assemble the burritos. Lay out a tortilla and spoon on 1-2 large scoops of refried beans. Use the back of the spoon to spread it evenly in a line on one side of the tortilla. Using the same spoon, add six spoonful’s of the rice and bean mixture to the tortilla on top of the refried beans. Roll into a burrito. Store individually in a reusable ziplock bag and store in the freezer. To reheat you can either use the microwave or heat in a skillet on either side! Enjoy!